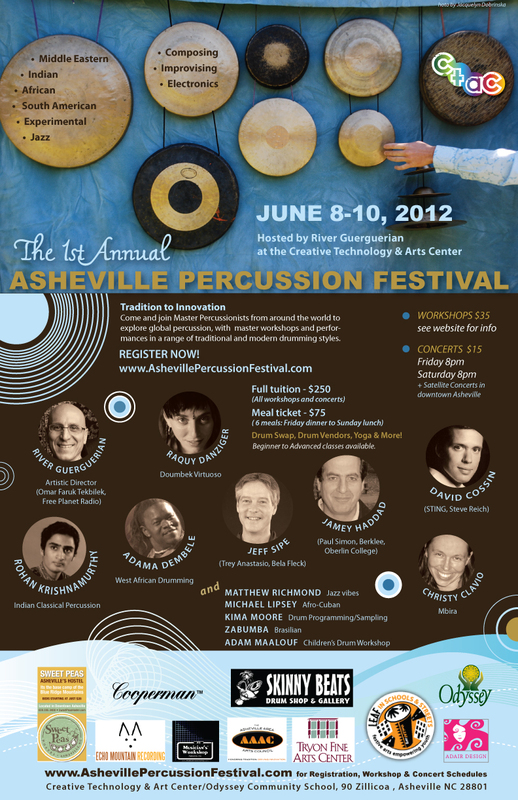 5/29/2012 – Asheville, NC – The first annual Asheville Percussion Festival will take place June 8th-10th, 2012 at the Creative Technology and Arts Center – Odyssey School in Asheville, NC. The theme is ‘Tradition to Innovation’. The festival will be hosted by Asheville’s ambassador to rhythm River Guerguerian. There will be workshops with Master teachers such as Jamey Haddad (Paul Simons percussionist), David Cossin (who tours with STING) and many other local and regional teachers. They will be covering topics such as performing, improvising and composing. There will be a concert with the Master Teachers for the community on Saturday June 9th at 8pm. The mission of the Asheville Percussion Festival is to provide a creative environment where percussionists of all traditions gather to explore, create and innovate. World-class percussionists will exchange ideas about performing, improvising and educating. Over the course of the weekend there will be workshops for drummers of all levels and concerts for the community. Adama Dembele is a master 33rd generation Djembe player from Ivory Coast, Africa. Michael Lipsey is an incredible educator and plays everything from Afro-Cuban percussion to Balinese Gamelan. He is the Director of the Percussion program and the New Music Ensemble at the Aaron Copland School of Music as well as the City University of New York. Middle Eastern, West African, Indian, Drumset, Jazz Vibes, South American, Performance Techniques, Improvising, Composing, Electronics, Microphone Techniques, Multiple hand drum set-ups, Hybrid set-ups. Friday night concert will include performances from the teachers and local talent from Brazilian and African troupes, as well as Jazz and Middle Eastern music. Saturday Night will feature a ‘Masters Concert’ with the collaborative efforts from all the teachers. They will create new and innovative percussion pieces through an Artist Retreat that will take place the week before. Asheville will become a creative hub for innovative and traditional percussion music by inviting international artists for outstanding collaborations. There will be opportunities for participants to jam with each other and the teachers. 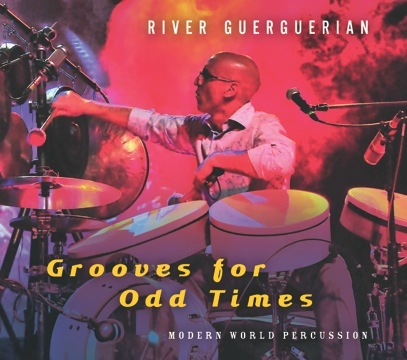 1/19/2012 – Asheville, NC – The percussion community is buzzing with excitement about the highly anticipated forthcoming solo CD by virtuosic Multi-Percussionist/Composer/Educator River Guerguerian titled ‘Grooves for Odd Times’. River has been inspiring audiences with his ecstatic and versatile percussion for over 30 years, and has performed and recorded with such groups as the BBC Concert Orchestra, Omar Faruk Tekbilek, Tan Dun, Tibetan Singing Bowl Ensemble, Paul Winter Consort, Chuck Berry, Sophie B. Hawkins, The Billy Sea and Ziggy Marley/Gipsy Kings. He also co-founded the world jazz group Free Planet Radio and Talujon Percussion Ensemble. The music on his new CD ‘Grooves for Odd Times’ represents a body of work that spans five years. This time period includes: 1) composing music for solo and mixed ensembles, 2) performing with inspiring artists, 3) recording/archiving the process of these creative cells. River has performed in many prestigious venues and places worldwide including Carnegie Hall, Lincoln Center, Sydney Opera House, Madrid International Jazz Festival, Barbican Hall (London), World Music Sufi Festival (New Delhi), Jerusalem Hall (Jerusalem), Edinburgh International Festival (Scotland) and even the White House! River received his Bachelor of Music from the Manhattan School of Music Conservatory, and has recorded on over 150 albums and film soundtracks. He also creates music for the purpose of meditation. His passion is researching the scientific effects of sound on the mind and body. River travels the world conducting Sound Exploration and Rhythm Workshops for people of all ages, and is Director of Music at the Creative Technology and Arts Center in Asheville, North Carolina. Whether playing with world-class symphonies or studio musicians, partnering with Grammy-award winning composers, or creating dynamic plays of rhythm for his own projects, River’s passion and attention to the vibrant life off the drum reverberates throughout the crowd. “I will be doing many performances in the southeast area, some in NYC collaborating with composers from the Aaron Copeland School of Music at the City University in New York, and a tour of Spain,” says River.